Western blot analysis of extracts from various cell lines using STIM2 Antibody. 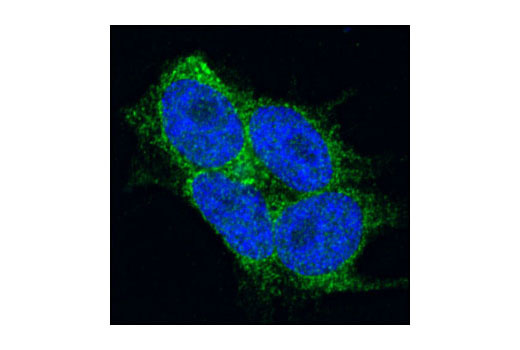 Confocal immunofluorescent analysis of HEK/293 cells using STIM2 Antibody (green). Blue pseudocolor = DRAQ5® #4084 (fluorescent DNA dye). 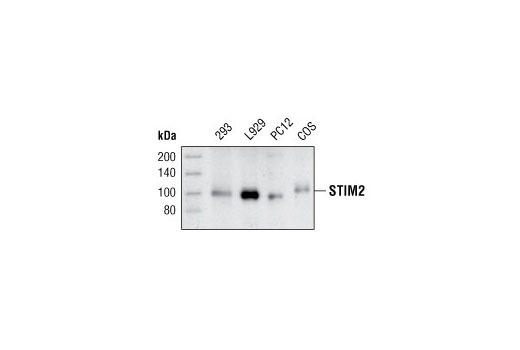 STIM2 Antibody detects endogenous levels of total STIM2 protein. Polyclonal antibodies are produced by immunizing animals with a synthetic peptide corresponding to the sequence of human STIM2. Antibodies are purified by protein A and peptide affinity chromatography. Ca2+ is a key second messenger in many intracellular signaling pathways. Ca2+ signals control many cellular functions ranging from short-term responses such as contraction and secretion to longer-term regulation of cell growth and proliferation (1,2). Stromal interaction molecules (STIMs) function as Ca2+ sensors that detect changes in Ca2+ content in intracellular Ca2+ stores (3). STIM1 is conserved, ubiquitously expressed, and functions as an endoplasmic reticulum (ER) Ca2+ sensor that migrates from the ER Ca2+ store to the plasma membrane where it activates calcium-release-activated calcium (CRAC) channels when the ER Ca2+ store is low (4). STIM1 is a potential tumor suppressor; defects in STIM1 may cause rhabdomyosarcoma and rhabdoid tumors (5). STIM1 can either homodimerize or form heterodimers with STIM2. STIM2 possesses a high sequence identity to STIM1 and can function as an inhibitor of STIM1-mediated plasma membrane store-operated Ca2+ entry (6). However, further investigation is required to elucidate the true physiological function of STIM2. Berridge, M.J. et al. (2000) Nat Rev Mol Cell Biol 1, 11-21. Berridge, M.J. et al. (2003) Nat Rev Mol Cell Biol 4, 517-29. Zheng, L. et al. (2008) Biochem Biophys Res Commun 369, 240-6. Zhang, S.L. et al. (2005) Nature 437, 902-5. Manji, S.S. et al. (2000) Biochim Biophys Acta 1481, 147-55. Soboloff, J. et al. (2006) Curr Biol 16, 1465-70.